The Arts Council of Oklahoma City has produced the Opening Night New Year's Eve celebration in downtown OKC since 1987. 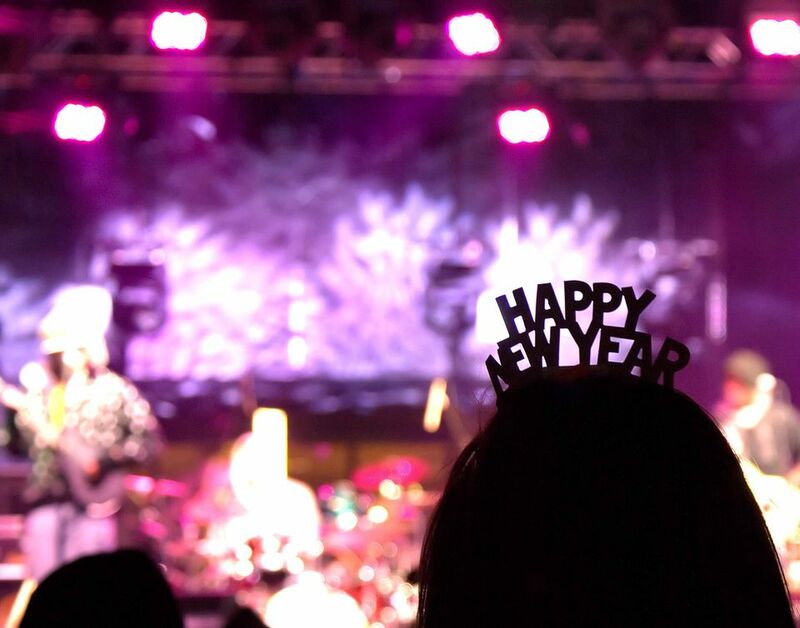 With a family friendly atmosphere that includes musical acts throughout the night, street performers, children's area, food trucks and a fantastic fireworks display, Opening Night is the top way to ring in the new year for Oklahoma City residents. Each year brings an estimated 50,000 people downtown to celebrate. Get information below on location, cost, performers and more. December 31st, of course. The 5k begins at 3 p.m., and the outdoor holiday festivities last from 7 p.m. to midnight. Final countdown begins at 11:30 p.m. with the fireworks scheduled for the moment the new year arrives. Bicentennial Park in downtown Oklahoma City is the site of the Opening Night celebration. The stage is set up in the park in front of the Civic Center Music Hall while food trucks are parked along the surrounding streets. The Children's Area is located in the Hall of Mirrors in the Civic Center Music Hall. Bicentennial Park is located between Walker and Lee, south of Robert S. Kerr Avenue and just north of Main. From I-40, northbound exits are available at Western and Robinson. Street parking is available in the area but fills up fast, leaving the best option for many to be the nearby downtown parking garages. Wristbands for Opening Night are $8 in advance and $10 at the event, with children 5 and under admitted free. Advanced purchases can be made beginning on Dec. 1 at any of the following: Metro 7-11 stores, MidFirst Bank locations, Plenty Mercantile at 807 North Broadway Avenue in Automobile Alley and at the OKC Museum of Art. Or you can purchase online even before December arrives. No alcohol will be served in any of the venues, and more information can be obtained by visiting the Arts Council of Oklahoma City online or calling (405) 270-4848. Performances: The live music and entertainment schedule features The Wise Guys, OKC Improv, Adam and Kizzie, Edgar Cruz, Steelwind Duo, Brisa Sur, The House Session, Bricktown Clowns, and Michael King’s One Man Circus. Other Entertainment: Across the park and surrounding street area, you might just find entertainment such as a scavenger hunt, marching bands, dancers, clowns, magicians and more. Children's Area: The Children's Area will include activities such as face painting, crafts, game area, music and more. Food Trucks: Several local food trucks will be on hand, offering a variety of dining options. They'll be parked in "Finale Alley" by the park. 2017 trucks include Bacon N Cakin, Hijo’s Taqueria, Junction Coffee, Let’s Do Greek, MacTastic, Pitchfork, Sizzle N Spice, Snow S’more, Taste of Soul Chicken and Waffles, and Wicked Hangry. Opening Night 5k: Just before the New Year's Eve Festivities is a USATF certified 5k run at 3 p.m., an event tradition for the past five years. The race path, which begins and ends just south of Bicentennial Park, travels through downtown along Walker Avenue and turns around all the way down at the Oklahoma River. Organizers ask runners to dress festively, and registration includes a wristband for the party later as well as a medal. Winners receive a work of art, as does the most festively dressed. Register online, or race day registration begins at 2 p.m. The Finale: The final countdown to the new year begins at 11:30 p.m., and the fireworks display will adorn the sky as 2018 arrives. The Arts Council of Oklahoma has been fostering artistic performance and presentation for years. The non-profit organization produces such city events as the Festival of the Arts, the Storytelling Festival, Art Moves, Out of the Box street performances and the Sunday Twilight Concert series at the Myriad Botanical Gardens lawn. The Arts Council is sponsored by, among others, Sandridge Energy, 7-Eleven Stores of Oklahoma, Homeland, Party Galaxy, Air Comfort Solutions and Bancfirst. The Arts Council relies on the generosity of volunteers and donations. To get involved, simply fill out an online information request form to indicate where you'd like to help, whether it be year-round or at a specific event. Monetary donations also can be made easily online using a major credit card.